With so many different materials to cut, and so many different kinds of cuts that can be made, it's no wonder that we carry such a vast array of cutting tools. Many cutting tools are designed for a specific application or material, and some are designed to produce a specific kind of cut in larger variety of materials. 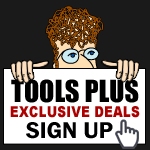 Tools-Plus offers a wide variety of cutting tools including Utility Knives, Wire Strippers, Crimpers, Cutters, Pullers, Pipe and Tube Cutters and more.